The Jungle Book is a really fun movie. In case you haven’t seen it, the film tells the tale of Mowgli, a human baby who is abandoned and raised by wolves deep in the jungles of India. When the wolves get word that the tiger Shere Khan is coming back to the jungle, they decide Mowgli must go live in the man-village; Bagheera the panther decides to take him there. Along the way, they meet up with Baloo the bear, and that’s when the story really picks up. The story is lighthearted compared to newer Disney films ie Beauty and the Beast, but like most of Disney’s best work, it has awesome songs and memorable characters. The jungle artwork is also really attractive. Overall, I would give this movie a 7.6/10, mostly due to the extremely awesome lineup of songs. Now, I think that after watching Robin Hood and The Jungle Book, it’s safe to say we’re firmly out of the 70’s and 80’s wasteland and into the Golden Age of the 50’s and 60’s. As we’re making our way into this period of the canon, several things are becoming apparent. First, there is a trend of snakes being able to hypnotize anyone and anything only using their eyes. In Robin Hood, Sir Hiss does it, in this movie Kaa does it a lot, and in Aladdin, Jafar has a staff shaped like a snake that he uses to hypnotize people. I’m kind of curious to see if it happens in other films. 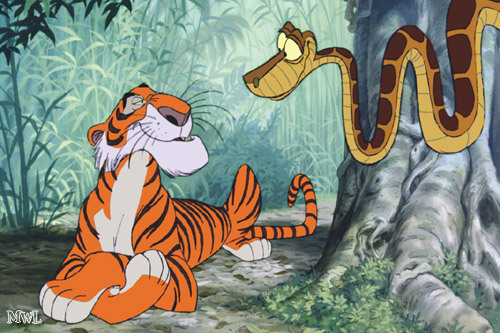 Shere Khan is immune to Kaa’s hypnosis. Second, much of the same talent is used over and over. Phil Harris had a major speaking role in the last three earlier movies we’ve watched, including this one. Eva Gabor played the female lead in two of the last three. Heck, even the di-rector is the same on many of these films (Wolfgang Reitherman). Sure, Pixar has a running gag of using John Ratzenberger in all their films, but they don’t have anything on Disney and their repeat directors and leads. They should book Tom Hanks to play the lead or second lead in the next couple of Pixar joints just to catch up. Third, jazz was the music back in the day. All of the catchiest songs in The Aristocats and The Jungle Book are wrought with jazz inflection, and I love it. Regarding the music of TJB, my two favorite songs are “The Bare Necessities” and “I Wan’na Be Like You”. There are several more songs than that, but those are the two that stand out. An interesting tidbit – in early pre-production, Terry Gilkyson wrote all the songs for the movie. However, the vibe of the movie in pre-production was deemed too dark by Disney, so everything up to that point was scrapped and new songs were written by the Sherman brothers. However, upon further review, the new production team decided they all liked the upbeat “The Bare Necessities”, so they kept it. Later, Harry Connick, Jr. would record “The Bare Necessities” as part of his participation in an album called “Simply Mad About the Mouse”. His version is freaking sweet. 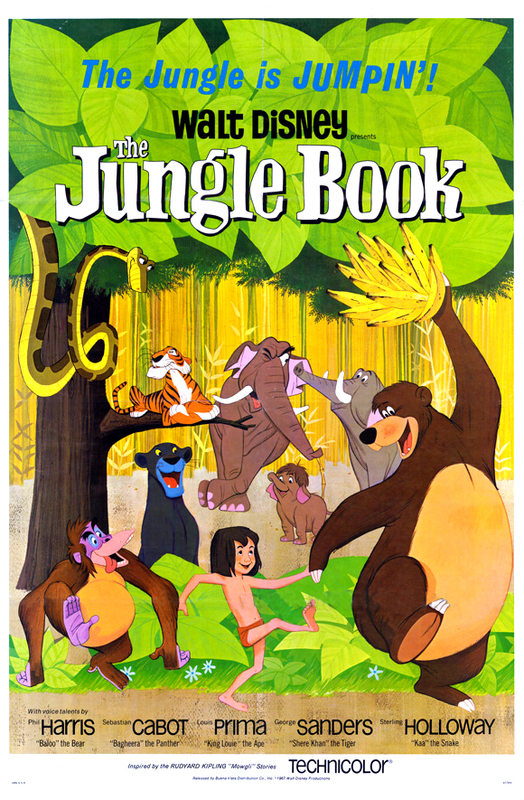 In all, The Jungle Book is a fun movie. I would say it’s mostly for kids, but the good music works for adults too. The memorable characters and attractive artwork also make this a very watchable movie. 7.6/10. Aladdin makes the most of magical situations. Here it is – my favorite musical animated Disney film. I love Aladdin. 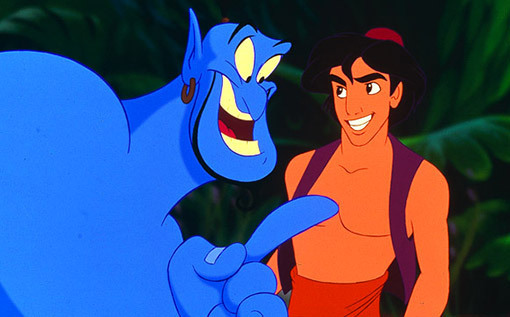 The story is great, the characters are good, the music is fantastic, and Robin Williams as the Genie is over-the-top in terms of terms and humor and such. I am biased, but whatever – I give this movie a solid 9.5/10!!!!!!!!!!!!!!!!!! Okay, I just threw some water on myself. Maybe 9.5 is a little high. How about an 8.1? Everybody good with that? Great. In researching the background of this film, I found it fascinating to discover that the idea for the movie came not from a Disney exec or some member of the creative team. Rather, it was proposed by a lyricist named Howard Ashman. What the heck? Anywho, he pitched the idea and then wrote a bunch of songs with composer Alan Menken; he also wrote an initial treatment for the film. Eventually the screenplay was re-written twice by two teams of screenwriters before the film was officially approved and moved into earnest production. 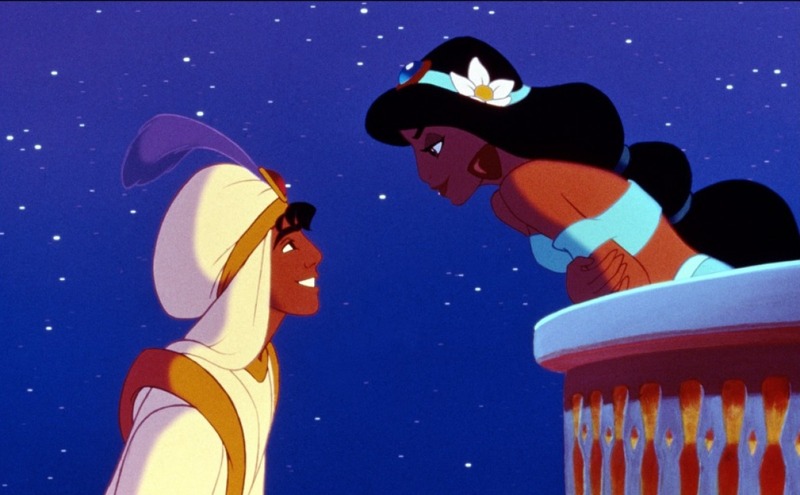 Aladdin and Jasmine are hoping for A Whole New World. “A Whole New World” was a beast, winning the Academy Award for Best Song and propelling a pair of singers named Peabo Bryson and Regina Belle to #1 on the pop charts after they recorded it as a single (supplanting none other than Whitney Houston who was riding the wave with “I Will Always Love You”). Anyway, it would seem that the moral of the story is that it takes all kinds of people to make projects happen. In this case, it took a lyricist to pitch the idea, two teams of screenwriters to get the screenplay right, and then another lyricist to devise the award-winning words, not to mention the hundreds of other people behind the scenes. Pretty cool, and a good life lesson about the importance of everyone. Robin Williams and the Genie have what it takes. Speaking of another person who completely made the movie like one billion times better – Robin Williams, come on down!! Whoever’s idea it was to get Robin Williams to play the Genie should be given an award and a stipend for the rest of their life. Uh, from the Academy, of course. What a totally brilliant move! His manic sense of humor was perfect – kids laughed at his zaniness and parents laughed at his actual meaning. By the way, you might be interested to know that Williams improvised almost all of his dialogue. He was given subjects and situations, but mostly he was left to his own devices. The animation team simply took his best stuff and animated it. How cool is that? At any rate, he makes the movie immensely more watchable. Actually, it occurs to me that if he wasn’t in the movie it would be quite a bit worse. Just like Steve Nash on the mid-2000’s Suns teams, Williams was the perfect fuel for the engine. If the film dragged, simply press the Genie button and everything gets better. He is the tie that binds and the glue that holds everything together. Perfect move by whoever made that decision. 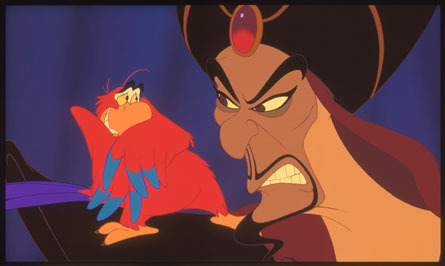 Jafar does not appreciate Iago. And forgotten in Williams’ shadow is Gilbert Gottfried, the voice of Iago. Long before he became the Aflac duck, Gottfried worked as a stand-up comic before doing a stint on Saturday Night Live. Somewhere along the way, he perfected his annoying, grating voice, and it turns out the voice was just as perfect for Iago the parrot as Robin Williams was for the Genie. So, if it isn’t enough to have Williams killing it, Aladdin also has Gottfried stealing nearly every scene he’s in. A very humorous movie. As always, there’s probably a lot more to be said, but suffice it to say, Aladdin is an excellent film. 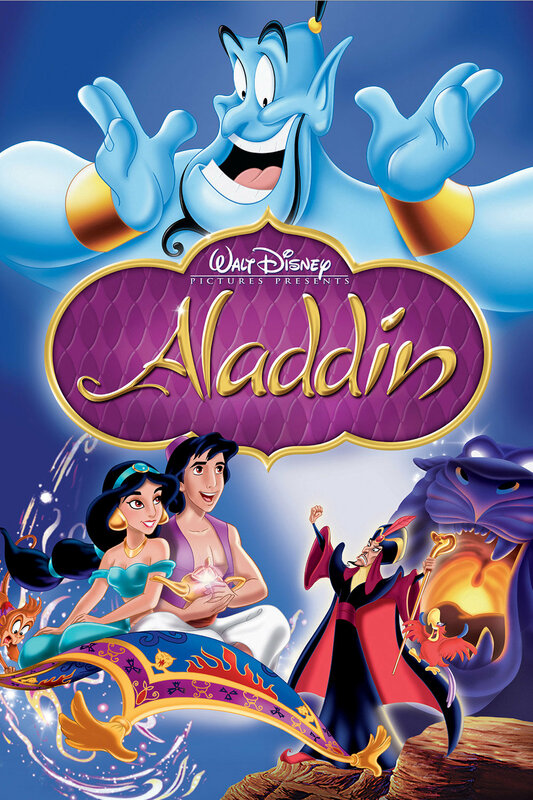 The songs are first-class, the story is captivating, the characters are good and there is enough humor to go around several times, especially with Robin Williams as the Genie. Simply brilliant, by Jove! 8.1/10 for average movie goers, 9.5/10 for me 🙂 🙂 🙂 :). Grant Stevens is a freelance freelancer who freelances freely. He enjoys watching movies with friends, and he loves tacos and basketball. Lately, he has been very into apologetics. He also dabbles in music. Check out his latest musical endeavors here.